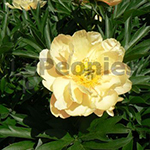 Singing in the Rain is a beautiful Intersectional Hybrid Peony. The semi-double flowers are coloured butter yellow, with slight orange flares. Singing in the Rain is blooming in the midseason with a light fragrance flowers up to 17 cm. Intersectional’s are also after the blooming period a welcome decoration while the foliage stays green until the frost. Beautiful for landscaping in gardens and city parks all over the world.